Fascinating book on the trial of the high command Generals from the National Socialist German period under Hitler. The book's focus is more on the trial and the aims of the trial than on any of the individuals on trial or prosecuting the trial. There is a chapter on the three judges with a focus on the head judge. Interesting how many of the judges were from state supreme courts. Just a few notes from highlights I made while reading: German General Hoth wrote about peace vs war as Hitler held meetings about beginning the war and noted that it would be a crime as ready as Germany was not to go to war. He noted that the laws of nature (science) supported their decision to begin WWII (Darwinian theory of survival of the fittest and how species are better thru struggle that eliminates the weak). One of the biggest, if not THE biggest error of the Americans made was failing to act on their goal of using the trials as an educational effort to let the common German people know about the terrible thing the National Socialist party was responsible for causing with their Final Solution (the holocaust). 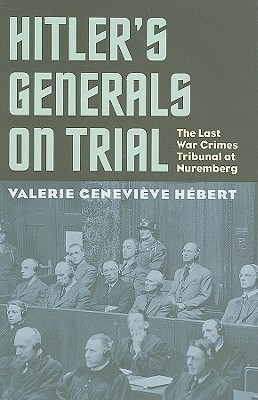 The trial records from the many trials were not published or made available to the German people. So the average person had newspaper stories, propaganda from the USA along with people who did not believe what the US was saying. When reports arose about American misbehavior it made it challenging to accept everything America was saying the Germans were responsible for. The Catholic and protestant churches began to support many of the people convicted at trial and argue that many of them were just following orders and that anything evil done on their watch was because of the nature of war rather than being an actual crime. Because the Americans failed to make their case to the German people and be transparent about what happened they lost a generation that ended up not believing the trials gave those convicted by them a fair shake. It wasn't until their children became adults into the 80s and 90s that the majority of the German culture began to accept the crimes that were levied against the German high command. Americans cared deeply about German opinion, indeed they commissioned 72 major surveys over four years to measure German attitudes to things like the occupation, economic and education reform, disposition of displaced persons, rationing, and the war crime trials. Toward the end of the trials observers noted a steep decline in interest in the trials. And, along with this more people responding that National Socialism was a good idea badly carried out. I wonder if the USA has been closely monitoring such things in Iraq and Afghanistan in relation to trials of captured fighters/terrorists. "Justice will surely fail in the absence of governmental commitment to support the verdicts and re-enforce the lessons they contain. Translation of trial documents, outreach to the public, and a time frame extending past the reading of the judgments are fundamental to any such project." (page 201). There is a good section towards the end of the book about the purpose of justice and what needs to happen to accomplish it. "For the criminal, who never saw his action in their moral dimension, punishment is imposed "in order to that the crime becomes a moral reality for the criminal - in order that he be swept into the truth of his atrocity." (page 203) "...the core lessons didactic trials aim to impart: that the world takes notice of and reject mass crime, that the perpetrator must confront the moral implications of his actions, that a victim's worth will be honored, and that society remembers the offense. The processes of didactic trials further serve educational efforts by gathering and interpreting evidence that clarifies the historical record. They make public that which is privately mourned and irrefutable that which is maliciously denied.... All of this is lost without the "declarative finality" of punishment. It is punishment that gives a trial the capacity to serve the ends of history, memory, and justice." (from page 203). The final 100+ pages of this book is made up of notes and appendix addendums.